Before you choose a listing agent in NYC, you must first realize that there are a number of ways you can avoid paying the traditional 6% total commission rate for sellers here in New York City. As a seller, you need to ask yourself whether you want to pay up for a full-service, traditional broker that will charge you 5-6% of the sales price as commission, or whether you are willing to go a more discounted route. Whether you choose to go full service, discounted full-service or sell FSBO, we will discuss the pro’s and con’s of each and explain how to choose a real estate listing agent in NYC for either option. There are differences in quality of service no matter how much or how little commission you end up paying. So when choosing a listing agent, discount broker or NYC FSBO company, it’s important that you are thoughtful and prudent in making your decision. Despite the enormous costs involved, over 95% of sellers in New York City ultimately decide to list with a full-price, full-service listing agent. Why? The reason why almost everyone pays 6% is because the powerful NYC brokerage industry (over 50,000 licensed agents) has done an excellent job of ‘selling’ the value of their services to NYC homeowners. This sounds really amazing, so it’s a shame that this is one of the biggest real estate agent lies in NYC. Let’s just think about this one for a minute. If listing agents have pre-existing ‘networks of buyers’, then why is the median listing time in NYC currently well over 90 days? If it really was the case that listing agents had specific buyers in mind for your listing, then your apartment should go into contract in a matter of weeks. This obviously does not happen. In fact, many of our current FSBO sellers actually came to us after failing to sell under a traditional, 6% arrangement with major brokerages in NYC. Perhaps the idea that a listing agent has a ‘network of buyers’ would be more credible if we were in the pre-internet era when 100% of available listings weren’t listed online for every buyer in the world to see. Although over 75% of buyers in NYC are still represented by brokers, the value in buyers agents is not in finding listings but rather in conducting pricing analysis, negotiating as well as offering a NYC buyer’s broker commission rebate. This is false and misleading because all brokerages who are a member of REBNY (Real Estate Board of NY) are required to share all of their inventory with every other broker in the city by posting the listings in RLS. Therefore, as long as you list with a REBNY member firm brokerage, your listing is already in front of every major buyer’s agent in the city across every firm that matters. The reality is that as a FSBO seller in NYC using our Flat-Fee MLS (RLS) package, you receive the same syndication and exposure to buyers as you would when using a traditional, full-service listing agent. Why? Our affiliates who help you list are all traditional, full-service REBNY member firms. They have the exact same listing syndication technology as every other modern brokerage in NYC. This one may sound enticing, however there’s no factual basis to back up this claim. Over 90% of wealthy, foreign buyers are represented by REBNY-member buyer’s agents. As discussed above, as long as you are listed with a REBNY member firm then your listing will appear in the listing database (RLS) used by all of the buyer’s agents who represent foreign buyers. 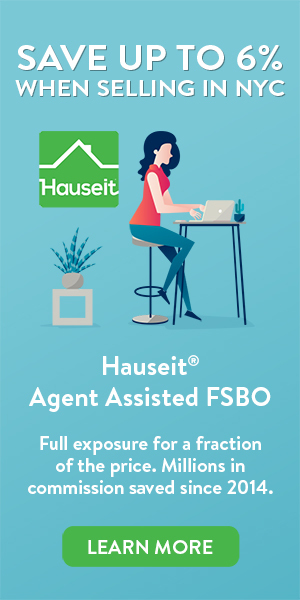 Even if you are listed agent-assisted FSBO via Hauseit, you have just as good of a chance of finding a foreign buyer as you would through a traditional, full-service listing agent. This is actually a true statement. However, the fact that it’s true doesn’t mean that the only way to take your transaction seriously is to pay 6% commission (over $100,000 in broker fees). Even if you want to work with a full-service listing agent, you can do so for as little as 1% commission. You may be asking, why would a reputable and traditional full-service broker be willing to work for so little commission? The truth is that there are over 50,000 agents and not enough deals to go around. Even though most brokers won’t openly admit it, the reality is virtually all of the them are likely willing to work on the additional deal for slightly less commission than they would otherwise. Most of the time however, the city’s brokerages do not permit their salespeople to reduce commissions. Thankfully, we’ve managed to solve this problem and offer our clients the ability to work with a full-service, REBNY member listing agent for just 1% commission. How do I choose a traditional listing agent in NYC? If for whatever reason you want to pay 6% and don’t think paying 1% for a full-service listing agent is sufficient, then you will still need to be careful about who you choose. You must remember that all of the agents running around the city are just ‘independent contractors’ working for brokerage brand names. What this means is that the quality is not consistent simply because of a firm’s name. The level of professionalism, competence and experience will be directly dependent on the person you choose and not the ‘firm’ they are a part of. Competence – is the agent professional, level headed and well spoken? Remember that this person will likely be in front of all of your unit’s potential buyers. So you don’t want an agent who comes off as being sketchy, arrogant or otherwise unappealing because it may dissuade buyers and buyer’s agents from working with your listing. Due to the low barriers to entry, you can find just about anyone working in real estate in NYC ranging from people with MBAs and CFAs all the way to people who have zero higher education. Responsiveness – the last thing you want is a lazy agent. How quickly did this agent respond to you? Do they work at all hours or do they turn off emails at 5pm every day? Buyers often have limited time to view units and often travel into NYC for a short period of time to view apartments and then quickly make a decision. If you do not have a responsive and available agent, there’s a chance you will miss out on many of these buyers! Experience – has the agent done a sufficient number of similar deals to indicate that he/she is well equipped to handle yours? If you are selling a co-op in NYC, what level of experience does your broker have in handling the co-op board package application process? What are the benefits of hiring a traditional real estate listing agent in NYC? Full marketing exposure to buyers (especially the ability to engage buyers’ agents). Buyers represented by agents are over 80% of the market. Experience with handling the complexities of coop sales – such as overseeing the NYC coop board package purchase application and being familiar with building policies, such as the coop sublet policy, house rules and alteration agreement. Agent acts as middleman in negotiations. Typically undervalued by home sellers who underestimate how emotionally attached they are to their homes. Commission only due if the listing agent secures a ready, willing and able buyer. All other expenses paid by agent upfront like professional photography, home staging, floor plan, advertising expenses etc. What are the negatives of hiring a traditional real estate listing agent in NYC? Considering how scarce inventory is in Manhattan and certain parts of Brooklyn, you may accept an offer with days. This may cause you to have material misgivings against your agent for not having “worked” for such a large commission check. Agents may use your listing and open houses to source more clients. Think your agent is giving equal attention to all buyers at your open house? Think again. Open houses have traditionally been a good way for agents to pick up new unrepresented buyer clients. When you sign an “exclusive right to sell” listing agreement, the agent receives authority to act on your behalf (i.e. as your agent). You receive all inquiry, offers and information from the agent so it better be someone you really trust! 1Not all Exclusive Right to Sell Listing Agreements in New York will have this type of language. Real estate agreements as negotiable as real estate broker commissions are negotiable. Please read our article on can a seller back out of an accepted offer in NYC to learn more! Discount real estate listing agents in NYC have a bad reputation because they are often low quality and do not offer a high quality of service to their customers. As a NYC seller looking to reduce your commission bill, you ideally need to find a middle ground and balance between cost and quality. Even if you pay 6% in commission there’s no guarantee that your listing agent will do an excellent job. At the same time, if you pay just 1% in commission to your listing agent it does not necessarily mean that your agent will be less competent or capable than a broker trying to charge you the full 6% commission. What are the benefits of working with a discount real estate listing agent in NYC? Assuming your flat fee “entry only” discount real estate listing broker has a good reputation (other brokers don’t all know and avoid him) and is a member of the relevant local inter-brokerage databases, you have the potential to engage and offer commission (or “co-broke”) to buyers’ agents who represent over 80% of all home buyers. For “entry only” real estate listing services you are typically expected to come up with your own listing price, photos and property description. The real estate listing agent in NYC will typically forward buyer inquiries for you to handle directly. You negotiate and close the deal without the assistance of the listing agent. What are the negatives of working with a discount real estate listing agent in NYC? Many discount brokers openly advertise their reduced prices which may hurt their reputation and cause other brokers to avoid them. Same issues apply for discounted full-service real estate listing agents as their full commission peers. Particularly with a small mom and pop flat fee “entry only” real estate listing agent in NYC, you’re unlikely to have the same degree of responsiveness from the agent or control over how your listing appears. How can I reduce my real estate commission bill when selling in NYC? Get listed everywhere a traditional 6% agent would advertise your home (StreetEasy, RLS, OLR, etc.) but for 0% commission and just a one-time low, flat-fee. As a FSBO seller, you will manage your own inquiries and negotiations to maintain complete control of the NYC FSBO process. You will also have control of your listing including status updates and how it appears. Free managed open houses – Hauseit offers up to 2 complementary open houses for our NYC Flat-Fee RLS (MLS) customers. Save time by having a licensed real estate professional manage your open house and protect you from in-person solicitation from other brokers. Have a full-service, REBNY member listing agent manage your entire home sale for just 1% instead of the traditional 6% NYC real estate commission. Whether you don’t have time to list FSBO or simply prefer to have a professional manage your sale, paying just 1% to an experienced, full-service listing agent more intelligently aligns the amount of commission you pay with the amount of work it takes for a listing agent to manage your sale process. With our 1% full-service listing option, you can expect to receive the same professional treatment and quality of service as you would by working with a reputable listing agent who charges you 6% in total commission.